There are many questions that baffle and perplex us; is it still an empty room if there’s someone it? Is it still priceless if it was free? AND now is a Big Mac® with bacon, still a Big Mac®? This is the first time the iconic burger by McDoanld’s has been changed in the UK since its creation in 1968 and opinion is divided on the addition. 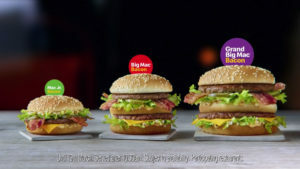 Big Mac purists are questioning if the burger should even be classed as a Big Mac at all, whilst others are welcoming the new addition in to the Big Mac family with open arms. A new campaign by Leo Burnett London was designed to get the nation talking and engaged in this huge debate. The TVC aims to demonstrate just how divisive adding bacon to a classic can be, showing different pairs and groups from around the UK hotly debating whether a Big Mac with bacon is still a Big Mac. 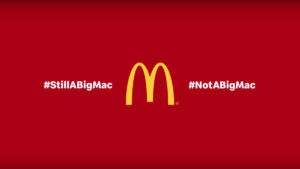 The debate will be brought to life in social and OOH with iconic digital screens across the country fuelling the debate with live percentage results for #NotABigMac versus #StillABigMac from Twitter, Facebook and Instagram. The digital OOH execution is produced by Grand Visual, with planning and buying by OMD UK and Talon. The campaign will also be backed with radio, print, digital and press, as well as CRM activity from Armadillo to support the advertising. The work broke on January 29th in the UK and Ireland. An online film featuring football manager and I’m a Celebrity winner Harry Redknapp, along with his song Jamie, also launched online with a nod to Harry’s antics during the football transfer window.